Solo amore/ Quando fuggeva lontano/ Speri invano ma non torni più./ Speri invano ma non torna più. - The blue synthesizer played by one of the Harry Kim and the Kimtones members is a Yamaha CS1x. The back of the synthesizer (bearing the Yamaha logo and various input/output ports) was disguised with a metallic-looking plate. - One of the Qomar spectators is the actor Leonard Crofoot, who played two characters in Star Trek: The Next Generation; Trent, the male servant of Mistress Beata from "Angel One" and the initial neutral-gender version of Lal, Data's "child", in "The Offspring". - The aria sung by The Doctor in his final Qomar performance is "Rondine al nido", by Italian composer Vincenzo de Crescenzo. Voiceover was provided by tenor Agostino Castagnola. This is the only time The Doctor's singing was not provided by Robert Picardo himself. "I believe the Qomar are attempting to disable our com system." "By overloading it with millions of teraquads of irrelevant data." "What do you mean by "irrelevant"? (reads) They are transmissions... all addressed to The Doctor." "Precisely. I've only been able to decipher a small fraction of them so far, but they include invitations to social and scientific functions, requests for personal encounters, cloying tributes to The Doctor's talents." "Computer, stand down red alert. This isn't sabotage, Seven. This is fan mail." "I'd like you to make an adjustment to my mobile emitter that would allow me to make quick changes between songs." "Oh, it will be! I plan to segue from Don Juan to Rigoletto in the blink of an eye. It will be a triumph of–"
"I have something for you." "Delete it. I don't want to read another word." "Then I'll read it for you." "Dear Doctor, I regret that your last performance was not as successful as you'd hoped. There are still those who appreciate your unique talents and admire you as an individual. I'll always consider myself your loyal fan." "It's signed "Seven of Nine, Tertiary Adjunct of Unimatrix 01."" This is my favorite episode of Voyager, hands down. I was mildly terrified of watching it in case it wasn't as good as I remembered or had some other aspect that I'd overlooked previously that would retroactively spoil it for me; thank the Prophets that that wasn't the case. It still made me cry, no joke. It's a canny and often funny take on the fleeting nature of celebrity, something that the Trek actors would probably relate to after going to their first convention--the bit where Seven interprets the flood of fan emails as a sort of DDoS attack was inspired--but in the end, it's about the Doctor's dream first seeming to be realized, and then crushed, and how he deals with that. A number of things really stood out for me in this watching: first, it doesn't minimize or excuse the Doctor's shortcomings--he's just as egotistical and arrogant as usual, which at first leads to his problems with the Qomar that he's treating, and then to his shock and delight when he becomes the Flavor of the Month. He could be Gilderoy Lockhart from Harry Potter when he's handing out his holo-glossies. For all of that, he's also still very much the romantic, which ends up causing him considerable pain. He also doesn't realize how important he is to the crew; some of that may well be because they haven't admitted as much, and each react in their own ways. I especially liked how Janeway at first tried to pull rank on him until he challenged her to treat him as she would any other member of the crew who wanted to leave, and then she admits that, yes, she and the others will actually miss him as a person. (Which kind of justifies his attitude that he's not appreciated.) He also nearly does something really stupid--deleting his medical knowledge when he's trying to become Tincoo's SynthBot5000--and it's B'Elanna, of all the people (more than a little impulsive herself sometimes, and irritated at the Doctor swanning around burbling about quick-changing into Rigoletto) who warns him about losing himself. But his grief and heartache at the end are devastating, in no small part because Picardo absolutely delivers during "Rondine al nido", even though he's lip-syncing, and dials it back as appropriate. It's a spot-on portrayal of the heartbreak of thinking that you've finally and truly found where and with whom you're meant to be, and then finding out that you were wrong all along. And, ultimately, the heart of the story is something that is sort of a commentary on a recurring Trek trope: the non-human who becomes human or essentially so, Pinocchio IN SPAAAAACE. Both the Doctor and Seven have been saddled with VOY's franchise for this trope, and I think that they both make a breakthrough of sorts. The Doctor is clearly about to confess his love for Tincoo, but at the very moment he's about to say it he realizes that it's no use, and watching Picardo's face as that realization dawns on him got me misty-eyed, but what really got the waterworks going was Seven's fan letter. Being Borg means never having to be sympathetic, and that little bit of compassion spoke volumes. And even Janeway's being hard-assed a bit when the Doctor rescinds his resignation was apropos; she was being hard on him because that's what she'd do to any person. And check her out when the Doctor finishes his ballad of lost love; my eyes weren't the only ones that weren't dry. "Rondine al nido" (Memory Alpha's page, which has a translation of the lyrics) has been done by a number of people; I discovered Jonas Kaufmann's version just tonight, and it's quite fine. Luciano Pavarotti's version is satisfyingly Pavarottish. But my favorite rendition is still Robertino Loreti's; he would have been about twelve or thirteen when he recorded this. Amazing. Also, the sheer cheek of making the Planet Without Music's president Paul Williams, of all people. Particle of the Week: Maybe the real particle of the week was the friends the Doctor made along the way. Pointless STO Comparison of the Week: As mentioned in some earlier reviews, autonomous sapient holograms have more applications by the timeframe of Star Trek Online (some 30 years after the finale of Voyager). I never saw any singers, but I'd be shocked if they weren't a thing someplace. In addition to his prodigious musical talents, Paul Williams played the Penguin for years and years in the DCAU. * This was a happy surprise. This is another episode I missed up until now, and it's a doozy. Jack's covered all this better than I was liable to: this episode is a wonderful compressed view of the Doctor's hopes, dreams, nature, relationships. The letter from Seven really is touching. 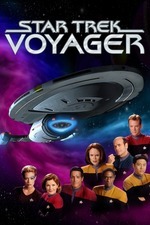 It's definitely in my top episodes of Voyager going forward. I wish they'd had more of these. Man. * The no-music thing is interesting. There's a school of thought that espouses the idea that language came from music, rather than the other way around. This episode made me think about that, since the Qomar were technologically advanced, but had never heard it before. To be clear, this isn't a quibble of any kind - this is a rare episode where I'm disinclined to offer any complaints at all - just a tangent I went on as they laid out the premise that I thought might interest folks. Anyway... yeah. This was great, a definite Trek classic. It's not like I hated it. The performances by Mulgrew, Ryan, and especially Picardo were engrossing, even a little moreso than usual. Good music, to be sure (though opera, while I find it agreeable, isn't really "my thing"—maybe that's the main reason my opinion differs from Jack and mordax's). And I too appreciate the stunt casting of Paul Williams, who got some genuine chuckles out of me with his performance. - As alluded to above, the notion of an advanced civilization that never developed music is…odd. I've always just found it hard to suspend my disbelief on that one. A failure of imagination on my part? - Perhaps most critically of all, the crux of the overall story isn't so much the Doctor's relationship with Tincoo as it is the question of "WILL the Doctor leave the crew to be a celebrity? ", which is a weak angle to me for two reasons. The first and more forgivable (i.e. we have forgiven it before, I'm sure) is that, because Show, we go into it knowing that he will not. But the one that really stuck in my craw was the inescapable feeling that I've seen this exact same "lead character gets famous, gets a big head, and forgets his friends" storyline in multiple sitcoms and possibly even Saturday morning TV shows. I didn't find it touching, notwithstanding the striking performances (especially from Ryan); I found it eye-rolling. Glad to hear some enjoyed this episode so much. I kept waiting for the A-plot to happen, or even the B-plot. The whole thing felt to me like a C-story that should have fit into another episode. And I'm a big fan of the Doctor, and a bigger fan of exploring starkly different alien cultures. The only sort-of-interesting note I took from this, was that if it were re-written today, it would likely focus less on the nature of celebrity and more on what happens when a computer program takes our jobs. While that was certainly a sci-fi topic in 2000, it's much more a relevant topic in 2018. Framing it with the Doctor - who is already a computer program - could provide some fascinating perspective. With CGI characters filling in for deceased actors, and the implications that brings with it, they could even keep the celebrity connection. the one that really stuck in my craw was the inescapable feeling that I've seen this exact same "lead character gets famous, gets a big head, and forgets his friends" storyline in multiple sitcoms and possibly even Saturday morning TV shows. TVTropes calls it Acquired Situational Narcissism (after a real condition), and there are indeed numerous examples from sitcoms and cartoons. But, even though it's the first trope listed in TVTropes' entry for "Virtuoso", I'd argue that it's at least partially averted because not only does the Doctor seem to come to some sort of realization that people on the ship really will miss him as a person before he finds out about SB5K, and shows some remorse for their feelings of loss (in particular, the scene with Seven, who is very obviously hurt), but that he seems to think that he has some sort of emotional connection with the Qomar, and in particular Tincoo. I think that a genuine narcissist would have been satisfied that their SynthBot still looked like him, but the Doctor is devastated. I'll admit, though, that part of my love for the episode is that I strongly identify with the situation of believing that a place or person was where I should be or who I should be with, only to find out that that wasn't, and never was, the case. If it's just me, I'm cool with that. Definitely a broadly relatable theme, no doubt. And not at all the first time that various of us have had stronger-than-average reactions (positive or negative!) owing to personal factors; I alluded to a similar leaning of my own in the "Distant Origin" post, which I think I can now safely say is my favorite VOY, in spite of its mildly dopey aspects.